Over the past month or so we’ve had reports that, for some people, the search results page was loading painfully slowly. It seemed to be something that only happened with certain browsers under certain conditions, so it took some sleuthing, but we found a few things that were plugging up the works. Last week we rolled a fix that should speed up the site for folks who were having the problem. Most of the changes happened behind the scenes, but there is one feature that we decided to give up in pursuit of speed. We removed the “Report an error” links that were under each search result because some browsers were having trouble with them and also because it didn’t look like they were being used. We’d like it to be easy for people to let us know about errors with the information on the site, because we’re eager to fix them. We appreciate the great feedback from people contacting us or leaving comments on the site about errors that they’ve found. 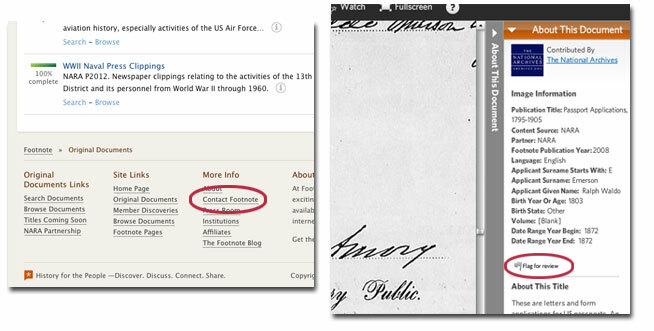 If you find errors on the site, the best way to let us know about them is to use the “Contact Footnote” link at the bottom of most pages or the “Flag for review” links that you’ll find in the viewer, on Footnote Pages and Spotlights and in other areas of the site. The more information you can provide about the error, the better. Often, when there is a problem, people annotate the correct information where it appears on an image. This is a great short term fix because those additions will show up in search the next time that image is indexed–usually a day or two. Even after we fix the error, the annotation makes that information easier to locate on an image. Commenting on an image isn’t the best way to send us a correction because we may not see the comment and once we make the correction, the comment will be out of date, but we’ve received some great corrections through comments and we appreciate people taking the time to add them. Thanks again to everyone who sends us feedback of any kind. Without it, we might never have known about the slowness or many of the errors that have now been corrected on the site. It’s great working with you to make Footnote better.